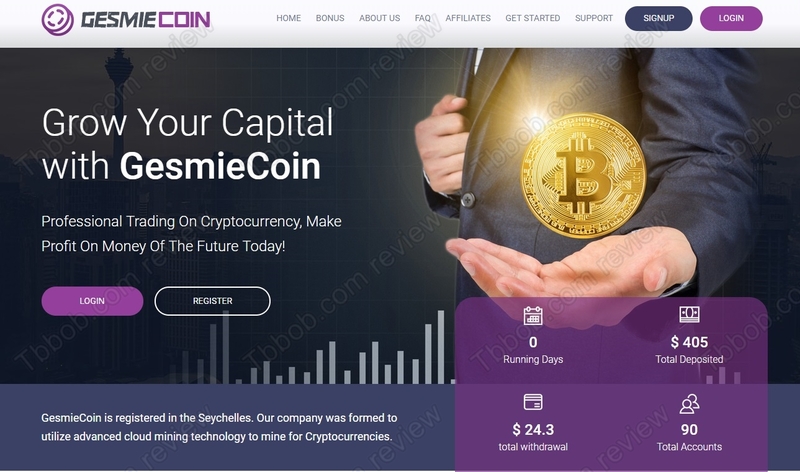 This review shows that Gesmie Coin is a scam meant to separate you from your money. GesmieCoin is supposed to be a company registered in the Seychelles. Its main activity is cryptocurrencies mining. You allegedly can profit from its activities, for example 30% per hour on your investment. The truth is that Gesmie Coin is a total scam. Nowadays it is difficult to make any money at all in mining, because cryptocurrencies’ prices are low. There is no way to make tens of percent per hour in mining, GesmieCoin is a scam. It works as a Ponzi scheme, it will collect money and maybe redistribute some of it on withdrawals. But it also can keep all the money and pay nothing. In any case that is a scam that will be short-lived, so you should stay away from it. There is no real company behind it, no real business activity is going on, just an illegal financial game. GesmieCoin is a scam that is going to collapse quickly, stay away from it! If you are interested in real crypto trading, try it first on a free demo with a regulated broker. In trading you can make, but also lose money, so act accordingly.